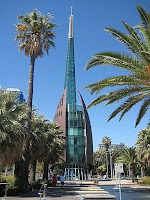 Wayne Mansfield: Perth.. should I leave?? I'm sick of Perth's violence, gangs, law courts with revolving doors, "get out of jail" free cards and the never ending boatloads of asylum-seekers. It sickens me that our young men are sent to fight and die in Afghanistan and their able-bodied men get free entry to Australia. So I said to my wife, "Let's go to Melbourne or Sydney." Hang on, it's not safe there - bigger bikie gangs, more drugs, Lebanese gangs, Asian gangs and the underworld. Maybe we could migrate - to England?? But wait, it's worse there - multiculturalism gone mad. All the Poms are coming here. they have had enough! That leaves Adelaide, the city of churches. But I was there last year, and as I sat in Rundle Street Mall I played "spot the Aussie." If Tasmania wasn't so wet and cold and had a footy team, just maybe. Well there is always New Zealand, but during the 2007-08 financial year, 34,500 Kiwis settled here so NZ has obviously lost its appeal. But wait. win Lotto, buy a yacht and we could sail away, leaving all our worries behind. Damn, I forgot about the Somali pirates. So I guess it's Perth and Western Australia with its wonderful climate, beaches, wineries, wildflowers, fishing and the many other attractions that I proudly call home. Note to Media: how about reporting the good stuff guys...and not all the crap.